The Resurrection of Christ, which we festively celebrate after several days of fasting, repentance and prayer, is the central mystery of faith and the life in Christ. Without the Resurrection of Christ we would be under the power of death, sin and the devil and there would be no way out of life. That's why the Apostle Paul declares: "If Christ has not been raised, our faith is futile and we remain in our sins" (1 Cor. 15:17). Christ by His Resurrection gave Grace to us to be spiritually resurrected in this life, as well as bodily at the Second Coming of Christ, as we confess in our Symbol of Faith: "I expect the resurrection of the dead, and the life of the future age." 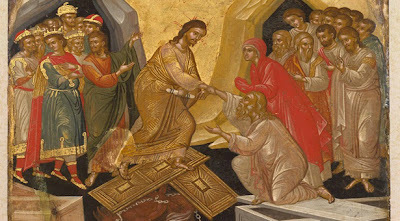 When we examine the issue of the Resurrection in terms of liturgical order, we usually talk about the First Resurrection as that of the Matins and Divine Liturgy which occurs the night of Pascha, and the Second Resurrection as the Service of the Vespers of Agape, which occurs on the day of Pascha, that is, the evening of the Sunday of Pascha. However, in Holy Scripture the expression first and second resurrection is associated with the Christian faithful and refers to the spiritual life. Characteristic is the passage from John the Evangelist which is written in Revelation: "Blessed is he who has a part in the first resurrection" (Rev. 20:5). This means that there is a first resurrection, which the saints participate in, and a second. To see what is the theological meaning of the first and second resurrection we must first consider what is the first and second death. The first death is the separation of man from God, Who is the real life, and the second death is the definitive separation of sinners from God that will occur at the Second Coming of Christ. Thus, the first resurrection is the communion of man with God, as long as man lives in this world within the Church, and the second resurrection is the communion of man with God at His Second Coming, when his body also will be resurrected. Therefore, the first resurrection that is within the Church is very important, where man lives biologically. This is the "period of a thousand years". In Revelation, John the Evangelist speaks of those who did not worship the beast and his image, and had not received the mark on their forehead and on their hand, and who "lived and reigned with Christ a thousand years" (Rev. 20:4). What is this period of a thousand years? According to Saint Andrew of Caesarea, the time of a thousand years is symbolic and characterizes a period "from the time of Christ's coming to the appearance of the Antichrist", that is, the period of the Church in history. Those who truly live in the Church with its Mysteries and asceticism live the first resurrection, and the second resurrection will occur when their bodies are raised at the Second Advent of Christ. Thus, according to Saint Andrew of Caesarea, there are two deaths and two resurrections. The first death is the spiritual and physical death, which came from man's disobedience to the command of God, and the second death is eternal hell. By extension, the first resurrection is "those who are brought to life from dead works", which occurs through Baptism, Chrismation and the deadening of the passions, while the second resurrection is the alteration "from the corruption of the body to incorruption." This means that when we live in the Orthodox Church, with the Mysteries and asceticism, we partake in the first resurrection, which, as Anthimos of Jerusalem writes, "is the the glory of God and grace", which is received "in this life by the saints". For those living the first resurrection there is no power "in the second death, which is the distancing from God." John the Evangelist blesses those who partake in the first resurrection who now live this biological life. These are saints: "Blessed and holy are they who have a place in the first resurrection", because "on these the second death has no dominion." Those who partake in the first resurrection will be "priests of God and of Christ, and will reign with them a thousand years" (Rev. 20:6). The Church, beloved brethren and children in the Lord, with all the splendor in which it celebrates the Resurrection of Christ, wants to encourage and motivate us to live the first resurrection from now, that is, the liberation from the passions and the life of the Resurrection of Christ in our hearts. Thus, we avoid the death of sin acting within us. In this way we will experience Grace, the love and peace of Christ within us, and this life unfolds around us. And then there will be hope for a second resurrection, the eternal communion with Christ. Source: Paremvasi, "Η πρώτη καί δεύτερη Ανάσταση", April 2011 (Paschal Encyclical, 2011). Translated by John Sanidopoulos.